You never know what you’re going to find while out metal detecting. I was looking at maps of some properties that I have permission to detect when I realized that one of the properties once had an old hotel that sat where a patch of woods not sits. Once there I noticed remnants of the foundation and decided to try my luck around there. It didn’t take long to realize that there was metal junk strewn all over that patch of woods. I did manage to get one good target though. At the time I thought it was a hotel key tag, but once I got it cleaned up I realized that it was something different. It turns out that it is a Tag from an early Frister and Rossmann Sewing Machine. “Frister & Rossmann was established in 1864 close to Berlin. In the 1880’s the Company was awarded Medals at various International Exhibitions. Frister & Rossmann became Germany’s largest sewing machine manufacturer a position it held until 1902. 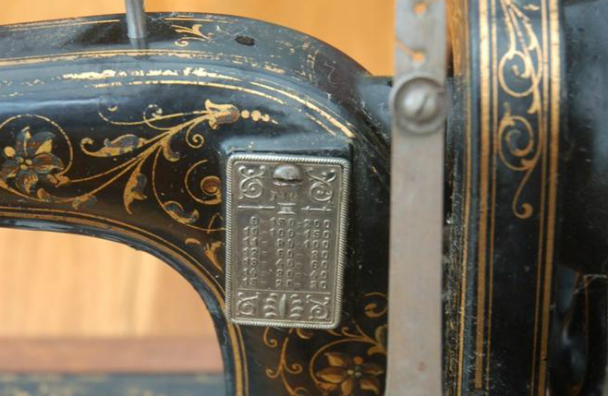 This entry was posted in Metal Detecting and tagged Frister and Rossmann, Frister and Rossmann Sewing Machine, Vintage Sewing Machine. Bookmark the permalink.